We all have mental visions about our ideal job. Especially after hearing some news about what one company is doing or how another person’s career or work life is situated. But have you really given thought to your ideal job? Other than the amount of money you’d like to make or the title you’d like to have? Where is ideal job located? What is the company you’d be working for like? What does your role look like? Essentially, it’s hard to get that ideal job if you don’t know what it looks like. Which is why it’s important to move it from your head to paper. 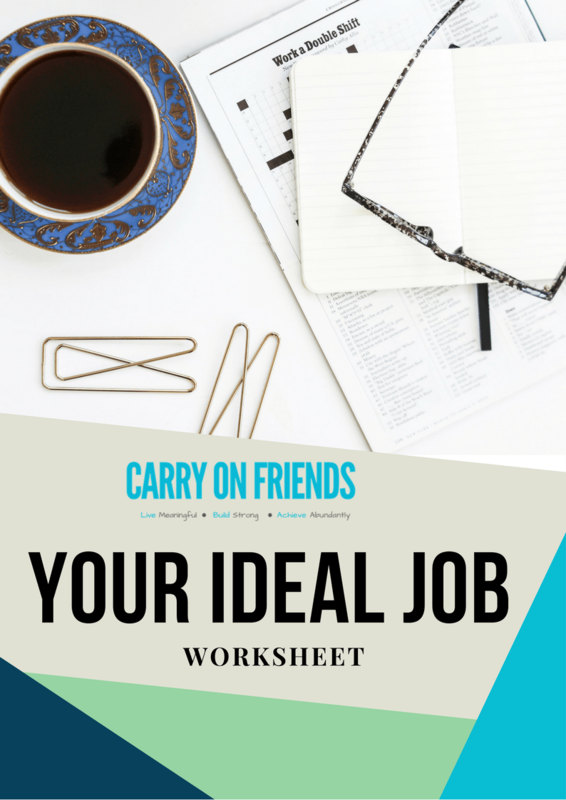 The Carry On Friends “ideal job” worksheet helps you identify what you want from a role, career and company. By completing the worksheet, you create a clear picture of what you need in order to feel satisfied – with not just your job, but your career which ultimately affects the other areas of your life. A career vision or career goals helps you know where you want to go. People who have goals and a clear picture of what they want from a role, career in their company do better. When you have a clear long term-vision you reach your goals. A career vision gives you hope, focus and direction. Use it as your compass but it shouldn’t be set in stone. Revise it at least quarterly but keep the older versions. Seeing how you evolve helps you with clarity as well. A career vision gives you focus & direction. Use it as a compass. This work worksheet was designed to help you think through your ideal job and your career goals. When completing the worksheet, it’s important to give your answers some thought. So don’t try to complete the worksheet all at once. Spend no more than 15 minutes in one sitting.